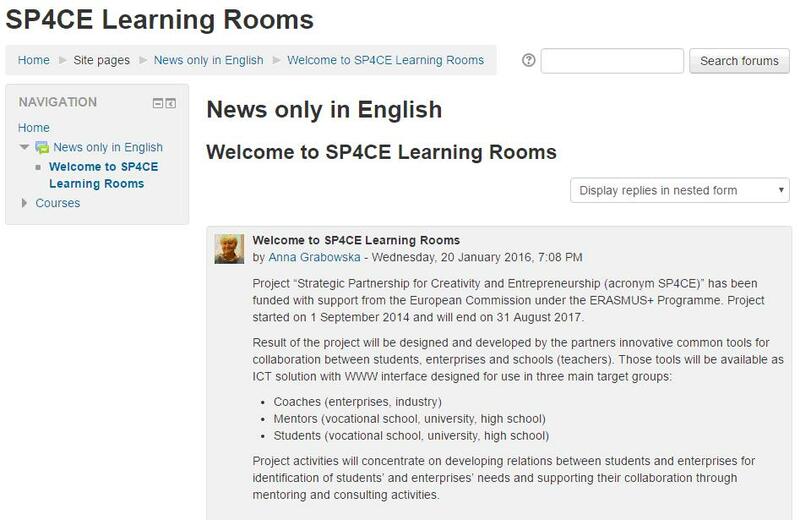 Using sp4ce.eu portal was published call for cooperation establishment in project management area. Both sides – T-Systems company and Faculty of Economics, TUKE (FoE, TUKE) – agreed on this co-work and its details. During discussions cooperation details they discovered that some of important materials cannot be published public, but they need some space just for registered users, where materials, new project proposals, company internal processes, etc. could be available in restricted way based on user role in the system. Platform SP4CE and its Learning Rooms (available at http://sp4ce.moodle.pl/) allows user registration and role assignment particular LRs (Fig. 2). For using this space, every user has to register into system. Range of features and tools depends on the role of the user within the particular LR. Possible roles are manager, course designer, teacher, student, guest and registered user. Based on the role user has available different group of sources, tools. Every SP4CE LR is concerned on specific problem that company face and publishable sources to help students understand the problem itself. Teacher help coach to provide materials that are useful for students, to prepare place for discussion, interactive cooperation, new solution proposals and evaluation. Coach – HR manager of T-Systems company, who provides materials that are useful for students, prepares place for discussion, interactive cooperation, new solution proposals and evaluation. Mentor – gives an introduction to the topic, to the main ideas and objectives needed to be achieved, help students to establish successful cooperation with coaches from companies, help to coach to develop structure of the learning room using different available features. Students – in connection to coach and teacher try to find out solution to provided problem, work out assessments, prepare project proposals. Coach in cooperation with mentor (teacher) prepares LR structure. Within this phase they discuss LS available and useable features of LR, kinds of activities needed to be done by students (Assignments, Feedback, Chat, Forum, Workshop), resources (Book, File, Folder, Label, Page, URL), which will be used in LR. They agree on evaluation methods of final results, manner of its publishing and level of access. Mentor address students – on lectures, via e-mail or other way to register to the system and prepared LR. Students could study provided materials and other resources, communicate with mentor or coach, work on project proposals, search or ask for additional information. Coaches and teachers manage all specific tasks needed to be done during the problem solution. LR users team consists of members with their own specialism and expertise, knowledge related to the problem to be solved. Using this collaborative environment takes students out of their usual studying to co-work with other with different ideas and knowledge and at not least with people from real companies. Everybody can use own competencies and skills to reach the best result. Coaches and mentors could evaluate and mark the students’ activity. To access the LR the registration to LRs system and access key is needed. Key is provided by face-to-face communication, via e-mail by the mentor. For work with LR itself no special software is needed, just user preferred web-browser (i.e. Google Chrome, Mozilla Firefox, IE a pod.). Maybe the solution of particular problems and tasks requires some specific software, but users have to be informed about it within LR. To prepare project proposal students need to use ordinary MS Office applications – MS Word, MS Excel, MS PowerPoint. The T-Systems company is global company with large clientele, what means a number of project documents, therefore it searches for potential employees every year. The management of the company decided to prepare their future employees during their study in the project management field. HR department has to find suitable candidates for such cooperation. After agreement between HR department of the company and teacher from FoE TUKE, HR department representative asked SP4CE platform administrator to create a LR named “Tvorba projektov pre podporu regionálneho rozvoja” (Project proposal design for the support of regional development). Finally, LR was used by 1 coach from T-Systems company, 1 mentor from FoE TUKE and 16 students. The main objective of LR use was to raise the interest of students in their subject of study and at the same time the way to approach solving some existing problem in reality in a creative way, to develop contact with real company. The LR was concerned on all knowledge needed to know during the successful project proposal preparation. Based on provided resources students start to work out their project proposals – they define the first draft of project proposal (name of the project, duration of the project, estimated budget, aim of the project, description of applicant, target group) (app. 20-24 h. – depends on the research of students in her/his surroundings for what could be designed a project proposal). During the whole project proposal development process, she/he should discuss his/her progress and ideas with the teacher, coach and other colleagues in the class. They could use on-line chat, discussion forums or instant messaging feature. Next students have to divide their proposal by sub-aims and particular activities of the project containing more detailed information (app. 20-24 h. – depends on the complexity of the project). During the whole project proposal development process, she/he should discuss his/her progress and ideas with the teacher, coach and other colleagues in the class. They used on-line chat, discussion forums or instant messaging feature. Students design the presentation of his/her project using electronic presentation concerned especially on project aims, sub-aims, justification of the project purpose, description of activities, outcomes, required budget and impact and sustainability (3-8 h. – depends on the ICT skills of the student). Students present the results in the common lesson, where during discussion other students should add comments and evaluate the work of others. These reactions are part of the final evaluation of the students’ project by the coach and teacher. Using SP4CE LRs environment, teacher plays the role of a mediator helping to company representative (coaches) to define the tasks to be solved and sources needed to get deeper understanding the problem. On the other hand, teacher helps students, via employing personalized learning approaches, collaborative learning and critical thinking methods, in developing solutions and communications with company representatives. Main positive aspect is that students use familiar environment that is familiar to them. The students develop their view of the matter around them and their creative access to its solutions. They learn methods and tools they can apply in their daily life operations. Development of project proposal took a longer time (particularly if the phases of project proposal development are spread across the whole semester – app. 4 months), because of the more complex objective of the task. Most of the work is done during homework; it should take app. 50 hours. In case of the need for study of the work with ICT tools, there is the possibility of studying these materials from home and have on-line/off-line support from the coach or teacher via LR. Do not take a too complex project challenges to which the students do not have any relation. The lack of ideas can then lead to frustration and de-motivation. Sometimes it is difficult for the students to start, their minds are blocked in finding a problem and the proposition of some solutions, in such cases it often helps to give examples of how to proceed. Due to the high complexity of the project it is necessary to describe all the phases and expectations of the product very precisely, to provide examples and active feedback on the students on going activity.